Room 2 Garden Buildings have had a long history building log cabin style buildings, but in 2016 they were approached by a customer looking for a more substantial building that could create a permanent home for their 82-year-old mother. The family wanted their mother to live closer to them, but retain some independence and decided that a granny annexe building in the garden was the solution. The brief was to create a home in the corner of the garden that comprised of a double ensuite bedroom, kitchen and light and airy main living room. Room 2 Garden Buildings worked with the client on the layout and specification of the building. The client wanted the building to be of a high specification. Plans and computer visualisations of the proposed building were produced for the clients to get a clear idea of what they would be creating. Once finalised these plans were then submitted to the Local Authority for planning approval – all granny annexe / micro home buildings require a planning application to be made. The process took eight weeks to be approved. The annexe is a substantial 10 meters x 5 meters. It’s built on a highly insulated 180mm thick SIP’s core structure and sits on an insulated concrete slab foundation. The flat roof is covered in an EPDM membrane; this is a popular finish on this type of building as it has a long lifespan and is fitted in one piece which minimises the risk of failure. The exterior of the building has been cladded in Western Red Cedar which again has a long life span and a natural resistance to fungal attack and rot. As you can see the Cedar has a lovely rich colour when newly fitted, but will age to a silver grey colour over the years unless a UV protector is applied. Bi-fold doors have been fitted in the main living room, these open up on to a good sized composite deck and create a real feeling of indoor/outdoor living. A fully glazed single door has been fitted for easy access in and out of the building. Casement windows have been used in the bedroom. All the doors and windows are powder coated aluminium, the high spec choice on buildings like this. Moving inside the layout of the annexe is well thought out. There is a good sized main living room with the kitchen cleverly positioned to be a separate room yet part of the main room. We like this layout; we more often see the kitchen as part of the main living space with nowhere to hide any kitchen mess! A modern shower room with good sized shower cubical has been created; this leads off the double bedroom. The annexe has been connected to the mains supply for water and sewerage. Modern electric heater panels have been fitted throughout the annexe. This is a well laid out granny annexe building that meets its brief of being light and airy. 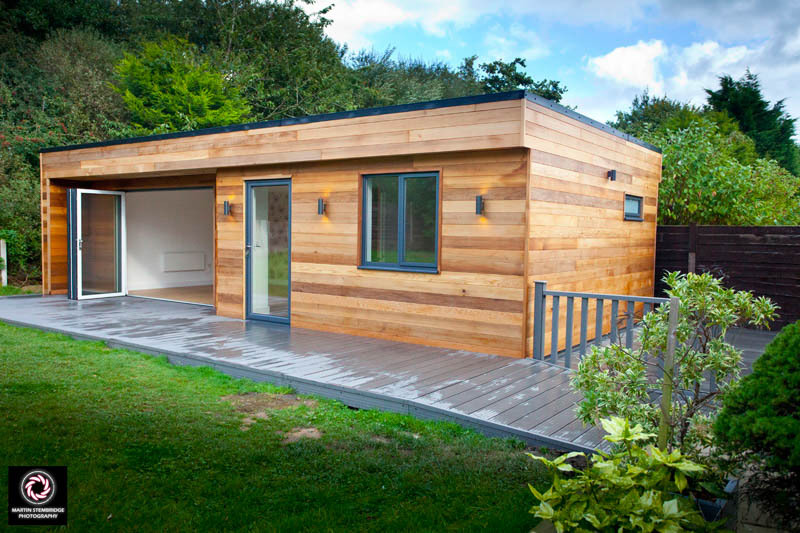 If you are based in the North West and looking for a highly insulated granny annexe building, then give the Room 2 Garden Buildings team a call on 07985 497 988 or email [email protected] a new website is under construction, but you can follow Room 2’s work on Instagram.